The densely growing Cytisus scoparius is a shrub indigenous to Europe and northern Asia that favours temperate climates and is found in abundance on sandy pastures and heaths. It is sparingly naturalized in sandy soil in North America. It grows best in dry, sandy soils in full sunlight and can also do well on soils high in boron. Where introduced, it colonizes pastures and cultivated fields, dry scrubland and \"wasteland\", and native grasslands. Most rapid spread of the plant has occurred along waterways where the seed is distributed by water. It is also spread rapidly along roads, where the seed is distributed by passing vehicles. Wind, birds, and other animals may also transport seeds. Seed re-introduction may occur from the sheep droppings during grazing. Hoshovsky (1986) reports that is a perennial shrub of the Fabaceae (Leguminosae) family. The shrubs are 1-2 metres high and deciduous. The green branches are strongly angled and appear naked or almost so. The leaves are trifoliolate with petioles 2-10mm long. The leaflets are obovate to oblanceolate, entire, strigose, and 6-12mm long. Unlike Cytisus monspessulanus (French broom) and Spartium junceum (Spanish broom), the yellow flowers of C. scoparius are usually borne solitary in axils. The glabrous banner is ovate to rounded; wings are oblong to ovate; and the keel is straight or curved. Petals are about 2cm long. The flaring calyx is glabrous, about 7mm long, and two-lipped with short teeth. The brownish black pods, 3.5 to 5cm long, are villous on the margins only. These pods are compressed, several seeded, and have a callous appendage or strophiole near the base. C. scoparius stands provide a more suitable environment for later successional species than gorse (Ulex sp.). It is leafless from late summer to early spring, allowing light to reach seedlings of later seral species. It produces a sparse, readily decomposable litter, unlike the acidic litter of gorse (Williams 1983, in Hoshovsky, 1986). Analysis of the results of a study (Sheppard et al. 2002), conducted to study factors affecting invasion and persistence of C. scoparius in Australia indicated that the presence of competing vegetation has little effect on C. scoparius regeneration. For more details please see ConservationEvidence.com, Case study 99: The effect of soil disturbance, grazing and ground cover compositon on the expansion of an invasive plant, broom Cytisus scoparius, in the Southern Tablelands of New South Wales, Australia. [extracted from: Sheppard A.W., Hodge, P. Paynter Q. and Rees M. 2002 factors affecting invasion and persistence of broom Cytisus scoparius in Australia. Journal of Applied Ecology 39, 721-734]. Seedlings buried more than 10cm deep fail to emerge (Hoshovsky, 1986). The fastest emergence occurs when seeds are buried less than 3cm deep in a fine textured substrate (Williams 1981, in Hoshovsky, 1986). Hoshovsky (1986) states that the seedlings may be damaged by frost, but this has little direct effect on their total height growth in their early years. Six to eight years of growth is followed by degeneration accompanied by an increase in the ratio of woody to green material, reduction in seed production, and finally death. They rarely live more than 10-15 years (Waloff 1968, in Hoshovsky, 1986). Hoshovsky (1986) cites that C. scoparius has been used for a variety of purposes throughout European history, beyond its use for sweeping floors. An infusion of the leaves was used as a diuretic. Bark shavings were used to stop the flow of blood in the 14th century. A salve was made from the blossoms. The tops of broom were put in beer to give it a bitter taste. Some people have used the seeds to \"adulterate\" coffee. The flowers in bud are pickled like capers. It is cathartic and the seeds cause vomiting. Broom has been used for thatching, fencerows, and cattle fodder. The woody plant was once used for tanning leather and the old wood for veneering. Cloth has been manufactured with the fiber. C. scoparius was sold as an ornamental in California in the 1860's. C. scoparius grows best in dry, sandy soils in full sunlight and will grow well in soils with pH values ranging from 4.5 to 7.5 (Gill and Pogge 1974, in Hoshovsky, 1986). In Europe it is found on moderately leached soils in heathlands, acidic grasslands, and inland dunes (Bicher and Larsen 1958, in Hoshovsky, 1986). It can also do well on soils high in boron (Vergnano 1957, in Hoshovsky, 1986). C. scoparius grows in more sheltered habitats (Davies et al. 1978, in Hoshovsky, 1986). Where it has been introduced, it invades pastures and cultivated fields, dry scrubland and \"wasteland\", native grasslands, and along roadsides, dry riverbeds, and other waterways (Gilkey 1957, Johnson 1982, Williams 1981, in Hoshovsky, 1986). It does not do well in forested areas but invades rapidly following logging, land clearing, and burning (Hoshovsky, 1986). Hoshovsky (1986) reports that C. scoparius may reproduce vegetatively or by seed. It has been purposefully propagated from cuttings (Gill and Pogge 1974, in Hoshovsky, 1986), and it sprouts back after cutting (Mountjoy 1979, in Hoshovsky, 1986). It can produce up to 60 seedpods per bush by its second year. Each pod usually contains 5-8 seeds (Waloff and Richards 1977, in Hoshovsky, 1986). Hoshovsky (1986) states that it can tolerate low soil temperatures and can fix nitrogen throughout the year in regions with mild winters. C. scoparius was sold as an ornamental in California in the 1860's (Hoshovsky, 1986).There has been a rapid spread of this weed, often for long distances, along roads where the seed is distributed by passing vehicles--often in gravel hauled from river bottoms (Hoshovsky, 1986). Review: Dr P.J. Bellingham. Landcare Research. New Zealand. Recommended citation: Global Invasive Species Database (2019) Species profile: Cytisus scoparius. Downloaded from http://www.iucngisd.org/gisd/species.php?sc=441 on 21-04-2019. 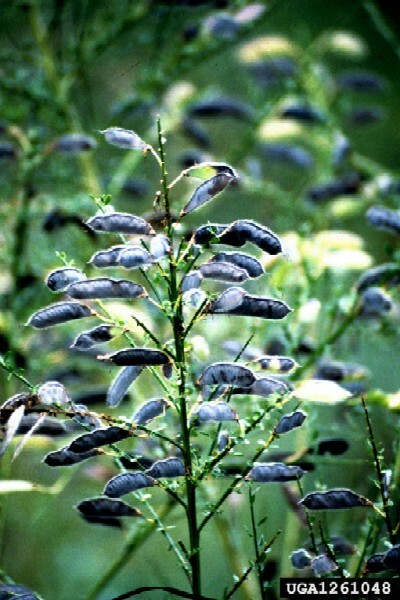 Hoshovsky (1986) states that C. scoparius' abundant production of long lasting viable seeds, aggressive spread, and establishment away from planted areas into stands of native vegetation causes it to be of serious concern. It prevents reforestation, creates a high fire hazard, in the United States renders rangeland worthless, and greatly increases the cost of maintenance of roads, ditches, canals, and power and telephone lines. In North America wildlife also suffers as the growth becomes too dense for quail to thrive and chokes out forage for deer. C. scoparius is slightly toxic and unpalatable to livestock, so it is very poor browse. Preventative measures: Hoshovsky (1986) states that soil disturbance should be kept to a minimum as it provides bare soil, which is very conducive to broom seedling establishment. Improper use of broadcast burning may contribute to a re-invasion. 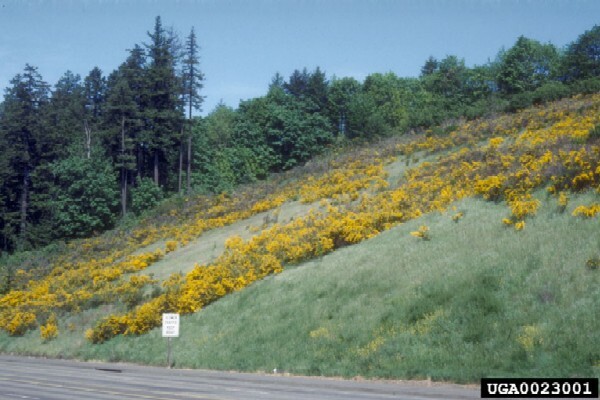 Planting of tall, growing shrubs or trees in or near C. scoparius stands may aid in reducing photosynthesis and possibly lead to their demise. Sowing native plant species which have the potential to out-compete weedy exotics for important resources is usually a preventive method of weed control. In some cases later successional plants may be encouraged to take root among the unwanted vegetation. C. scoparius stands provide a good environment for the establishment of other broadleaved shrubs or trees. Such seedlings should be looked for in the stands and encouraged. In addition, seeds of taller growing plants should be sown among this weed. For details on chemical, physical and biological control options, please see management information. Informations on Cytisus scoparius has been recorded for the following locations. Click on the name for additional informations. Summary: The objective in creating this website is to provide the means of collating information on conservation management, sources including published papers, reports and the evidence of practitioners. Hoshovsky, M. 1986. 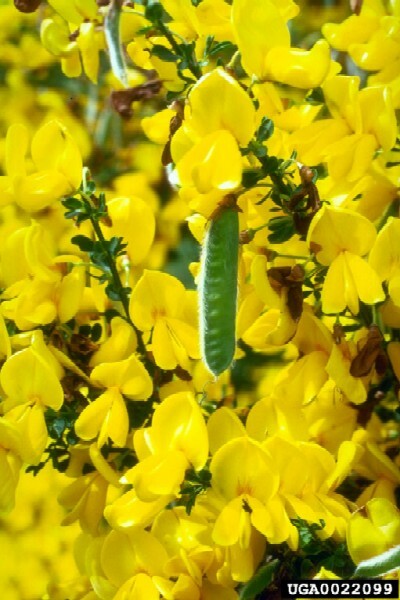 Element Stewardship Abstract for Cytisus scoparius and Genista monspessulanus. The Nature Conservancy. Murray, C. and C. Pinkham. 2002. Towards a Decision Support Tool to Address Invasive Species in Garry Oak & Associated Ecosystems in BC. Prepared by ESSA Technologies Ltd., Victoria, B.C. for the GOERT Invasive Species Steering Committee, Victoria, 96 pp. Summary: Short report on description, history, cultivation, and uses. USDA-ARS (United States Department of Agriculture, Agricultural Research Service). National Genetic Resources Program. Germplasm Resources Information Network - (GRIN). [Online Database] National Germplasm Resources Laboratory, Beltsville, Maryland. Summary: Information on common names, synonyms and distribution of species. Wilcox, M. D. 2003. Cytisus scoparius. In PlantWorld - a compendium of plants of the world. Mangere Bridge, Auckland, New Zealand (unpublished). Summary: Brief summary on species in New Zealand.